Water splitting combines sunlight and water in a chemical reaction in order to harvest clean hydrogen energy. By smoothing the surface of hematite, a team of researchers led by Boston College chemist Dunwei Wang achieved ‘unassisted’ water splitting using the abundant rust-like mineral and silicon to capture and store solar energy within hydrogen gas. Finding an efficient solar water splitting method to mine electron-rich hydrogen for clean power has been thwarted by the poor performance of hematite. 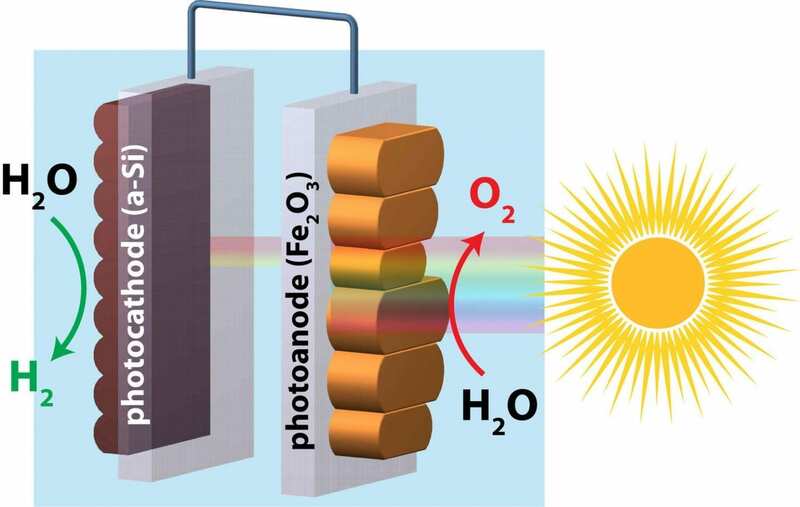 But by ‘re-growing’ the mineral’s surface, a smoother version of hematite doubled electrical yield, opening a new door to energy-harvesting artificial photosynthesis, according to a report published online today in the journal Nature Communications. Re-grown hematite proved to be a better power generating anode, producing a record low turn-on voltage that enabled the researchers to be the first to use earth-abundant hematite and silicon as the sole light absorbers in artificial photosynthesis, said Boston College associate professor of chemistry Dunwei Wang, a lead author of the report. The new hydrogen harvesting process achieved an overall efficiency of 0.91 percent, a ‘modest’ mark in and of itself, but the first ‘meaningful efficiency ever measured by hematite and amorphous silicon, two of the most abundant elements on Earth,’ the team reported. Wang said the findings represent an important step toward realizing the potential performance theoretical models have predicted for hematite, an iron oxide similar to rust. The team, which included researchers from Boston College, UC Berkeley and China’s University of Science and Technology, decided to focus on hematite’s surface imperfections, which have been found in earlier studies to limit ‘turn-on’ voltage required to jump-start photoelectrochemistry, the central process behind using artificial photosynthesis to capture and store solar energy in hydrogen gas. The team re-evaluated hematite surface features using a synchrotron particle accelerator at the Lawrence Berkeley National Laboratory. They established a new ‘re-growth’ strategy that applied an acidic solution to the material under intense heat, a process that simultaneously reduced ridges and filled depressions, smoothing the surface. Tests immediately showed an improvement in turn-on voltage, as well as an increase in photovoltage from 0.24 volts to 0.80 volts, a dramatic increase in power generation. The team reported that further modifications to the new hematite-silicon method make it amenable to large-scale utilization. Furthermore, the ‘re-growth’ technique may be applicable to other materials under study for additional breakthroughs in artificial photosynthesis. April 12, 2019 - 11 Myths About Energy Harvesting Electronic DesignIs energy harvesting expensive? Hard to implement? We'll dispel some of the myths surrounding the technology. March 27, 2019 - Energy Harvesting Tech Harnesses Photovoltaic Power Sensors OnlineTechnology uses the power of ambient indoor and outdoor light to achieve a battery-free IoT. April 10, 2019 - Research focus: Exploring novel energy-harvesting materials Open Access GovernmentYuzuru Miyazaki, Professor at the Department of Applied Physics, Tohoku University, enlightens us on his research on novel energy-harvesting materials. March 22, 2019 - Bluetooth and energy harvesting make a smart (lighting) match LEDs MagazineThere's an interesting and unexpected bit of intelligence in a small detail from our latest connected lighting webcast.